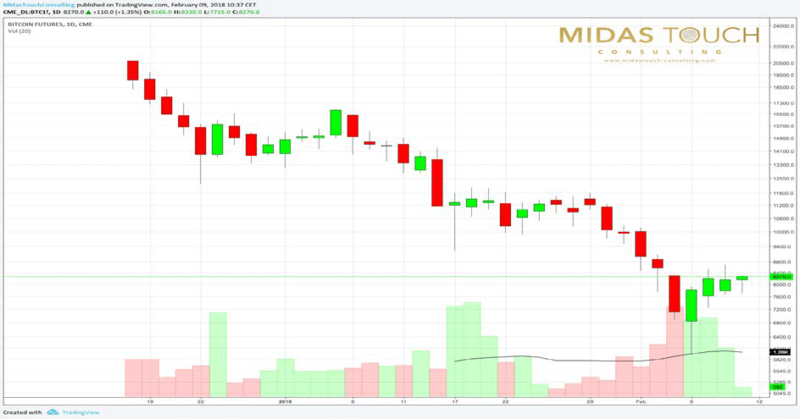 » Technical Analysis: Is a Crypto Winter About to Start? After an epic rise from $162 up to $19,886 in just over two years, the price of Bitcoin fell by nearly 70 % between December 17, 2017 and February 6, 2018, to under $6,000. Alternative cryptocurrencies (altcoins) came under tremendous pressure too and some of them lost 80–90 % of their recently achieved all-time highs. Meanwhile, at least Bitcoin was able to recover some of those losses and has reached $11,300 again. Early cryptocurrency investors are still sitting on very comfortable gains, but investors who started during the last two to three months have underwater positions. They are only hoping that Bitcoin & Co. will recover as soon as possible. It is yet to be seen if this relatively new group of mostly inexperienced market participants will be able to follow the well-known battle slogan “hodl”. To cryptocurrency investors, hodl is the strategy of simply holding all purchased coins and tokens through any correction, trusting that the crypto and blockchain technology is still at the very beginning of its development and that in the medium to long term much higher prices are to be expected. Although this approach has worked extremely well over the last nine years, this strategy must be seriously questioned in light of the current bloodbath and the possibility of another two-year “crypto-winter”. Ultimately, many roads lead to Rome, and every investor or trader has to decide for himself or herself which strategy suits them best. The pain from the enormous volatility of cryptocurrencies and the incredible patience required by the hodl strategy is simply not for everyone. Here an investor’s psyche is challenged to the utmost: especially if they follow the market closely and regularly. If they look at prices just once every few months, the hodl strategy will naturally be much easier. If one considers the possibility that Bitcoin is a bubble, the hodl strategy becomes questionable. Investors who experienced the Internet bubble at the end of the 1990s know that the classic “buy-and-hold” strategy will eventually stop working. An investor could be right for many years, but if they missed a sale during the highs in 2000/2001, they lost their entire investment. Most of the Internet stock highflyers went straight into bankruptcy. A similar fate soon or later will probably impend to most of the altcoin bag holders. In this regard, the hodl strategy must be viewed critically and should at least be accompanied with appropriate risk management. Another approach to making money with cryptocurrencies is short-to-medium-term trading (day trading / swing trading). Using the help of classical chart analysis, cryptocurrencies can be screened for possible entry and exit signals. Of course, here too, many roads lead to Rome, meaning to success. Every trader has his or her personal favorite indicator or setup, and he or she has an appropriate time window and their own risk management approach. It is therefore not possible to come up with a successful strategy for everyone. However, the crypto market is based on the same laws and principles as all other markets. The crypto market is not as distorted by intervention as other markets, such as the bond market, which is heavily manipulated by central bank quantitative easing. Since there is less distortion, many technical analysis strategies and indicators work better because prices are surrogates of real information about market participants. All in all, trading in the crypto market also involves consistent risk and money management and above all a professional approach. Investors who treat their trading as a business will naturally be more successful. As the crypto market has seen a clear uptrend over the last two years, all traders should have made good profits. Anyone who has not managed to make money in these markets must seriously ask him or herself if trading is the right occupation. The bottom line is that the crypto market will run the same way as any other market in the medium to long term: an estimated 90 % of traders paying in and only 10 % of traders making consistent profits. For longer-term investors, this ratio improves slightly to around 80 % losers and 20% winners. Why does Pareto’s 80/20 rule apply to investors? Quite simply, nobody knows the future, and trading and investing is about psychology. Ultimately, everyone pokes around in the dark: some with more experience and discipline, others completely overwhelmed by their emotions, a third group is an unclear mix of both, a fourth group, the so-called greenhorns (especially active in the crypto sector), and finally and unfortunately, a certain number of criminals or fraudsters! How well does the trader know him or herself? How disciplined is he or she? How exactly did they do their homework and their preparations? Are they acting emotional or rational? Are they immediately convinced by exaggerated promises of profits? Do they take losses personally? Can they accept losses as part of trading & investing or are they dwelling over their losses forever? How much do they think they can predict markets with extensive fundamental analysis or sophisticated charting? Is the trader ready to learn from their mistakes? Do they take responsibility for their results? Has the trader accurately calculated the risk before buying? Therefore the ancient Greek aphorism “Know thyself!” applies to any participant in the crypto market as well as in all other markets and of course in life in general. Anyone who made a conscious investment decision must also have a plan to exit. Whether this is based on technical signals, fundamentals, sentiment data, or a mixture is ultimately everyone’s personal decision. However, there is an important difference in the crypto market. Many “millennials” believe that cryptocurrencies will replace our fiat money system. They are convinced that they do not need to exit because they will be able to directly spend their cryptocurrencies one day. As seductive and idealistic as it may sound, the victory of decentralization is not sure yet! In any case, the established financial system will certainly not give up its power and its control without massive resistance. Therefore, a partial exit into other asset classes may be part of a prudent strategy if an investor’s portfolio becomes too heavily concentrated in crypto assets. Sentiment analysis sheds a questionable light on cryptocurrencies because the mood of the crypto market continues to be extremely optimistic, if not idealistic. For market participants interested in the medium to long-term timeframe, sentiment analysis is probably the supreme discipline. Anyone who understands mass psychology can determine highs and the turning points of long-term trends with amazing accuracy. Ultimately, market prices are created by constantly fluctuating perceptions of market participants. 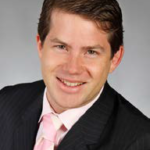 Subsequently, there can never be an objective or fair price of an asset. If a financial asset is heavily discussed in the mainstream press, it can be assumed with great certainty that everybody is invested in it already and that there will be no more new buyers. Therefore, it would be advisable to do the opposite of the masses once such signals appear. The problem, however, lies in the relatively small number of crystal clear signals. For example, the front-page of the German newspaper Bild showcased gold bars during the top of the gold rally in August of 2011. Regarding Bitcoin, the online edition of the Süddeutsche Zeitung reported Bitcoin’s colossal price gains exactly two days before its 2013 high on November 28, 2013. As everybody knows, Bitcoin crashed from $1,156 to $162 in the following months and disappeared for two years into a crypto winter. However, sometimes the signals can be accurate. On December 17. 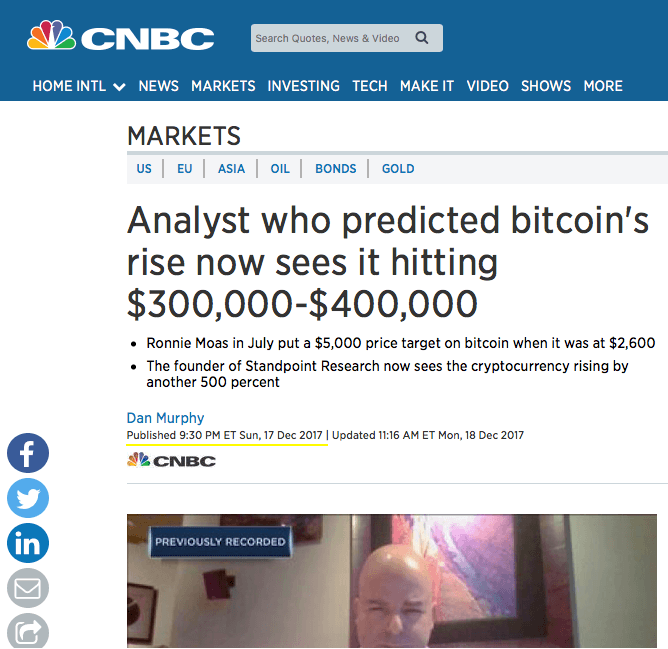 2017, CNBC delivered a perfect sell signal with their headline: Analyst who predicted Bitcoin’s rising now sees it hitting $300,000–$400,000. In addition to the famous front-page indicator, there are of course many other approaches to measure the mood among market participants. In the young crypto market, there is no established sentiment data available. Futures on Bitcoin have been trading for only two months with relatively manageable volume. As a result, traditional sentiment data such as put-call ratios, Sentix, and sentiment surveys are not available to the extent that investors are familiar with from other markets. The website sentimenttrader.com provides a well-functioning sentiment indicator called Bitcoin Optix. Here, an automated algorithm compares Bitcoin’s expected future volatility with the current price behavior and the discount of a Bitcoin ETF in relation to its NAV. Recently, the sentiment indicator reported an extremely pessimistic sentiment, but this has strongly recovered over the last couple of days. 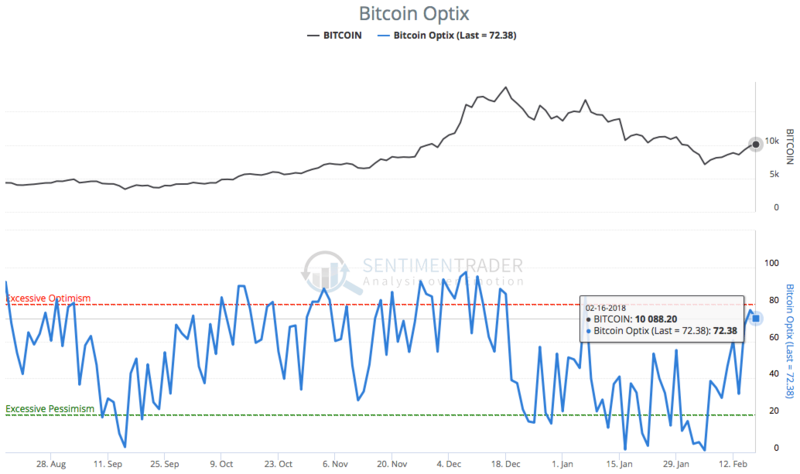 The latest sentiment data clearly shows that the early February recovery in Bitcoin brought sentiment back to very optimistic levels. Alternative sentiment indicators are also of interest in the crypto sector. Twitter tweets, Reddit posts, the size of a telegram group, or simply the contents of YouTube comments can be helpful for gauging the market’s mood. For example, investors can find numerous comments that expect an asset’s price to rise to the moon very shortly below any YouTube video about finance, gold, or crypto. As a true contrarian, that should give you something to think about. Right after the launch of Bitcoin Futures trading in December, Bitcoin lost 70%. Currently, only major financial and economic news portals have added a new crypto section; however, more data analysis and reporting are needed because new trading opportunities via Contracts for Difference (CFDs) and Bitcoin futures are available. For example, data on Bitcoin Futures are available in the U.S. Although futures exchanges were originally created primarily to hedge future fluctuations in market prices (for example, agriculture producers), hedge funds and private traders use futures markets to profit from price fluctuations. Since all of the futures markets in the USA are regulated, the Commodity Futures Trading Commission (CFTC) publishes the current positions of traders every Friday. This information is completely new to the unregulated crypto market and should become very helpful and valuable in the medium term. In the short term, however, only a very thin data series is available so that comparisons and classifications of the current positions have to be treated with caution. Based on the current CoT report for Bitcoin Futures, it is obvious that traditional funds (asset managers / institutional investors) are not heavily invested in Bitcoin. Similarly, there is virtually no position of hedgers (intermediary dealers). This is because there are not many securitized products available on Bitcoin, which would have to be hedged via the derivatives market. In contrast, the “leveraged funds” (hedge funds etc.) have significantly expanded their short positions in recent weeks, which means that they occupy 50.2 % of the open interest. The “other reportables” (dealers with systematic trading approaches and high volume) show more or less balanced positions. Finally, the small speculators continue to be massively long, representing 48.5 % of all open interest. The large short position held by hedge funds and at the same time the strong bullish position of small speculators rather point towards further falling prices. It is also noticeable that the correction in December began pretty much on the day when Bitcoin Futures started to trade. However, an obvious causality is not easy to detect. After such a brutal crash, it always makes sense to take a look at the big picture. Otherwise the short-term high volatility may cause investors to lose sight of the larger trends in the market. On the weekly chart, Bitcoin’s long-term uptrend is still intact. Basically, the price for one Bitcoin has returned back to where it was trading at the end of November. So far, the sharp correction ended just below the typical 61.8% – Fibonacci retracement. If the overall correction continues, the next lower retracement level (76.4 %) would be around $4,818. This level coincides with the intermediate high at $5,000 from last September. Therefore, technically it is still possible that the price of Bitcoin could fall towards $4,500 – $5,000 in the coming months. This assumption is also confirmed by the fact that Bitcoin temporarily dipped below its green uptrend channel. Despite the fast recovery and the move back into the channel, the general support of this uptrend channel has been weakened. The weekly chart for Bitcoin still has an uptrend intact. In the “worst case” scenario, one target of the correction could be another significantly lower uptrend line (currently around $2,075). The lower Bollinger Band ($3,236) also offers a lot of space and will need much more time to reach current price levels above $11,000. A very encouraging signal, however, is the new buy signal that comes from the slow stochastic oscillator. After reaching its oversold zone this indicator now has turned and would have a lot room to move higher. 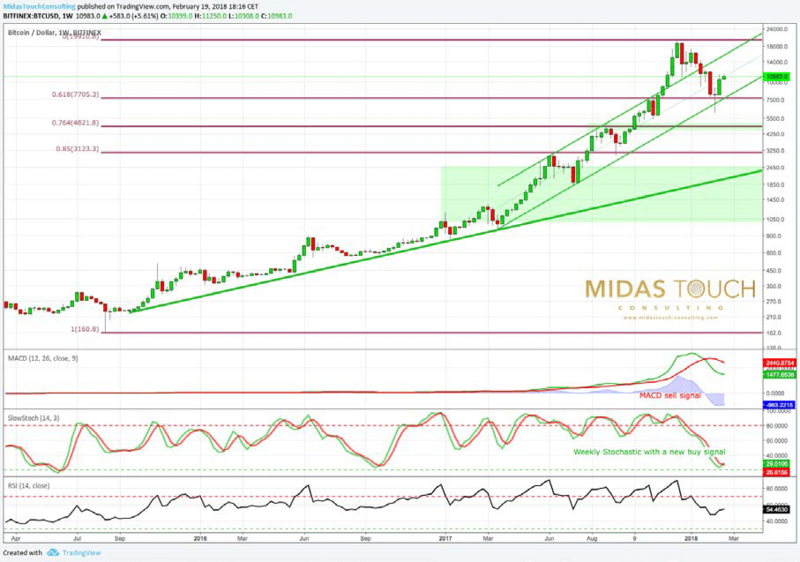 On the Bitcoin daily chart, the recovery, which began just two weeks ago, has already made up well over a third of the previous correction, and has now reached the classic 38.2 % Fibonacci retracement around. On the daily chart Bitcoin’s recovery is very overbought. Prices above $12,200 are bullish, any move below $8,000 is very bearish! $11,300. Bitcoin’s price trajectory for the next couple of months will most likely be determined at this important resistance zone. If Bitcoin prices can breakout above $11,300, bulls will be back in charge and should quickly push prices towards $14,500. If the bulls instead fail at this first Fibonacci retracement, it would be a clear sign of weakness. In that case, everything will depend on the support zone around $8,000. The crypto markets are either facing a winter or the beginning of the next rally. 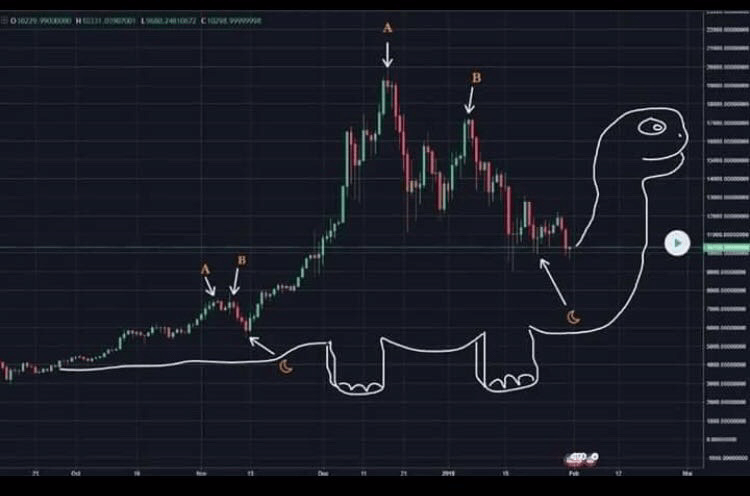 Using a slightly more complex Fibonacci projection consisting of the first down wave from $19,889 to $10,700, and the bounce back up to approximately $17,200, the 1.236 % extension would be at $5,891 and the 1.382 % extension at $4,550. The first extension was already reached when Bitcoin hit a low at $6,000. The 1.382% extension confirms further downside potential towards $4,500 to $5,000. Given the strongly overbought situation on the daily chart, a pullback is getting more and more likely in short term. Despite the strong recovery, one should realistically assume that the crypto market is not out of the woods yet. The correction that begun two months ago may take a few more months, if not a year or two, or even longer. Bitcoin could possibly fall back to about $5,000 and theoretically correct as low as $2,500. For most of the altcoins this would mean dramatic losses again. Only a move above $12,200 and especially above $14,500 will increase the odds that the correction is over, and Bitcoin is on the way to new all-time highs. Facing the ongoing crypto euphoria, it cannot be ruled out that Bitcoin and the crypto sector are already in a corrective winter cycle. The future is unknown, but this young asset class will likely experience further correction. In addition to the described blind idealism, the rather bearish CoT data and the questionable technical picture do not yet speak for a rapid rebound or rallies to new all-time highs. However, cryptocurrencies and the blockchain technology will not disappear. On the contrary, after a hard and possibly bitter winter, Bitcoin prices beyond $50,000 and $100,000 are certainly possible in the coming decade. If Bitcoin prices move above $12,200 and $14,500 in the short term, reconsideration of the bearish outlook is expected.